Abby Ann Thompson is a miracle child, born in November, and over two years in the making. Abby Ann Thompson (at right) is a miracle child, born in November, and over two years in the making. While all childbirths are miracles, surrogacy pregnancy reveals how truly miraculous every step of pregnancy is, according to Gary and Karen. They had to worry about steps that most couples take for granted. While most couples don't even learn about their pending pregnancy until after it has started, the Thompsons worked for a year to get to this same point. "She is our little Christmas angel, our Christmas miracle," said Karen. "She truly is a miracle." While most people take having children for granted and don't think about it, Karen has known since she was 16 years old that she would not be able to have a natural childbirth because of a medical condition. Having known for so long that she would be unable to bear children, Karen had ample time to consider alternatives, like adoption. While neither adoption or surrogacy is cheap, adoption is a surer bet, because normally, eventually, the process ends with an adoption. For surrogacy, the Thompsons not only had expensive out-of-pocket medical expenses and other logistic costs but they had no guarantees that it would actually work. At every step something could go wrong...and sometimes seemed like it nearly did. "You just have to have faith," said Karen. Gary and Karen talked about having kids before they got married in October 2001. "We both knew that we wanted children," said Karen. "Actually it was Gary that suggested we try surrogacy," said Karen. Within two months of getting married, they had started to actively investigate surrogacy. 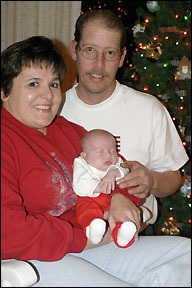 The Thompson family - Karen, Abby, and Gary - are at home in Union Grove Township for Christmas. "We just wanted to try," said Karen, who grew up in Cold Spring and has been a speech pathologist for the Paynesville Area School District for 16 years. "Thinking you'll never have a biological child and then having a chance is a dream. I guess I never thought it was a possibility." They were rejected by a clinic in the Twin Cities and then tried the Mayo Clinic in Rochester in March 2002. This started a rigorous, nearly two-year effort that culminated with the birth of their daughter in November 2003. The Thompsons had already asked Karen's sister to be the surrogate mother, and she had agreed when they applied to the program at the Mayo Clinic. The first steps were to review their genetics and their family history and to do family counseling. In May 2002, Karen and Gary made their first visit to the Mayo Clinic in Rochester and met with the team of doctors and the genetics team. One of the things they determined was that Karen's medical condition was not hereditary. "That's when we got excited because that's when they said, 'Go ahead,' " said Karen. Around Labor Day in 2002, Gary and Karen and her sister and her husband all visited the Mayo Clinic. Logistics were a bit more complicated because Jacki and her husband, Allan, live in northern Virginia. In addition to medical tests, they had to complete psychological testing to determine that they were good candidates and were attempting surrogacy pregnancy for the right reasons. For instance, the medical team wanted to be sure that Jacki just wanted to be an aunt, despite being the surrogate mother. Every step was nerveracking, according to Karen and Gary. "At any moment, you're waiting for them to say, 'That's it,' because they said at any point in time they could cancel us," said Karen. The day after they got home from their Labor Day visit in 2002, the Thompsons were informed that they had been approved by the board at Mayo and had been accepted as surrogate candidates. In December 2002, they returned to the Mayo Clinic for an orientation session, where they learned the details about the medical procedure. After that, the Thompsons had to draw up a legal contract, required by Mayo, covering a host of issues, such as what should be done if Jacki were in a car accident during the pregnancy and who would be the legal guardians if something happened to Gary and Karen during the pregnancy. They had to be very thorough and dot every "i" and cross every "t," said Gary and Karen. 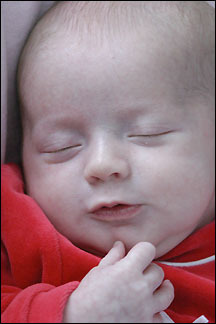 Finally, in February 2003, they got the final go-ahead to start the medical procedures for the surrogacy pregnancy. For Jacki and Karen, that meant starting medication to get their biological cycles in rhythm and to prepare for the egg transfer. For Valentine's Day, Gary joked, he started giving Karen her shots! Abby poses with her mother Karen (left) and her surrogate mother, Karen's sister Jacki (right) in Virginia after being born last month. In mid-March, Jacki was planning to come to Minnesota for the transfer, when the doctors thought they would need to delay the retrieval of eggs from Karen, potentially disrupting the family's carefully constructed logistical timetable. Karen produced just two eggs, where normally a half dozen or more would be available for retrieval. But the lead doctor said two would be fine if Karen was willing to try, which she was. "Thank God," she recalled thinking upon learning that the procedure was going forward. '"This was a total roller coaster," she added. "At every step, we were waiting for the other shoe to drop." On March 19, 2003, two eggs were retrieved from Karen, and Gary did his part, the easiest part, they joked. Both eggs fertilized, and two days later they were transferred to Jacki. Then it was time to wait. For 12 days they waited to learn if Jacki was indeed pregnant. While most want-to-be parents have no clue about their pending pregnancy at this point, for Gary and Karen, this was a crucial step, as were all the other steps. After investing a year into the surrogacy process, they knew that this was basically their one shot at a biological pregnancy. When Jacki - who stayed at her parents' home in Cold Spring during this time - took a blood test that confirmed the pregnancy, it was time to celebrate. "That was a happy day," said Karen. "We had been waiting on pins and needles." The worrying was not over, though. Both of Jacki's kids had been premature, so the Thompsons were concerned with how her surrogacy pregnancy would go, especially since it would be so difficult to try again. Jacki had to continue on medicine to avoid rejection of the implanted egg even after she returned to Virginia, where she has two young kids of her own. Once the pregnancy was achieved, Gary and Karen mostly had to wait. In July, they got to see Jacki during a family vacation. In August, Karen traveled to Virginia to go to the first ultrasound with Jacki, seeing a picture of their baby for the first time. "I bawled. It was very emotional," said Karen, on seeing concrete proof of the pregnancy. "It was reality for me. I don't feel the baby. I can't visualize it. You know it's happening, yet it's removed from you." In October, Karen visited Virginia again in order to go to another ultrasound appointment. 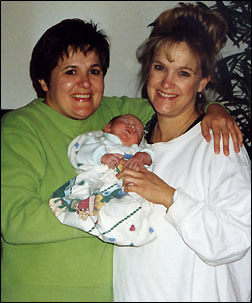 By this time, Jacki's surrogacy pregnancy had lasted 32 weeks, longer than either of her other pregnancies. This was a key milestone because the baby was expected to survive on its own after that, if trouble with the pregnancy developed. "Every day after that was a bonus," said Karen. Jacki had scheduled a C-section for the Monday before Thanksgiving, and Gary and Karen had made arrangements to fly to Virginia. Then Jacki's water broke ten days early, on Friday, Nov. 14, and Gary and Karen had to scramble to make new arrangements to go to Virginia. Abby Ann Thompson was born at 1:27 a.m. on Saturday, Nov. 15. Her proud parents arrived 12 hours later. Karen kisses her biological daughter, whose birth was made possible by the wonder of modern medical science. Almost their entire family thought the baby was going to be a boy, they said, except for Gary's mom, Florence, who correctly predicted a girl. Karen stayed, along with her parents, in Virginia for a couple weeks until Abby was ready to travel back to Minnesota. Virginia was nice, said Karen, but it was nice to be home, too. Abby's middle name, Ann, is short for Angel, which the family called her during the pregnancy, when they did not know if she was a boy or a girl. It is Jacki's middle name, too. The Thompsons are quick to point out that they needed lots of help for their miracle pregnancy. It took a family effort, from Karen's sister and brother-in-law and their family, who made sacrifices in their lives in order for Jacki to be the surrogate mother; to Gary and Karen's employers, who were so understanding; to their family and friends, who were so supportive. The staff at the Mayo Clinic, especially the nurses, as well as their families and close friends, were extremely supportive during these crucial medical steps. "Omigosh, it was truly amazing," said Karen. "Everyone was praying. I think it was the power of prayer that got us through because so many things tried to get in our way." She is now planning one return trip to Rochester. This one will be joyous...to introduce Abby to the medical staff who enabled her birth. Abby Ann Thompson will be baptized on Sunday, Dec. 28. Gary and Karen had an easy choice for godmother in Jacki and for godfather, Gary's brother Ron. Karen said she is forever grateful for the unconditional love shown to her by her sister in agreeing to be the surrogate mother for Abby. Her sister, she said, is an angel, too.